OPM Group in Leeds has detailed the benefits it has seen since deploying GEW’s hybrid ArcLED UV curing technology. Last year, OPM acquired a customized configuration of a UV curing system installed on an additional Nilpeter flexo press, featuring nine GEW systems comprising five arc lamp stations and four UV LED lampheads together with ArcLED Rhino electronic power supplies and a chill roller with each print unit. The configuration is able to print flexo and coatings on multiple substrates and multi-layer compounds. GEW introduced ArcLED last year as a futureproof hybrid UV curing system that allows an investment in arc technology now that can be upgraded later with LEDs using the same lamphead casing, and the same power supply and control. The decision to invest in the GEW ArcLED UV system was due to OPM’s desire to reduce energy use, increase productivity and to offer its clients a wider range of products. With the GEW ArcLED system, OPM has been able to achieve significantly higher speeds as LED curing is used to target and relieve processes that were bottlenecks with conventional arc lamp UV curing. 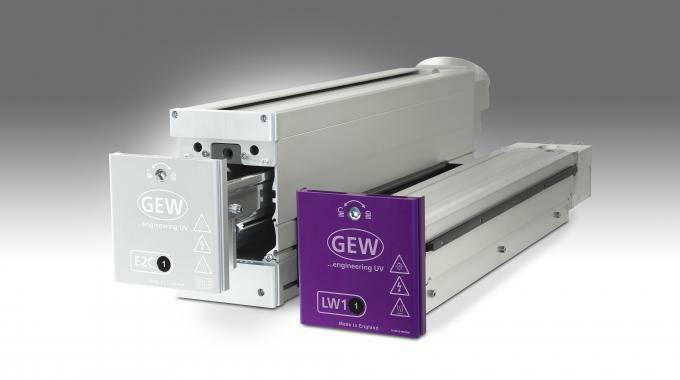 The high intensity longwave output of GEW’s UV LED lamps enable these processes to be run at speeds of up to 175m/min. Chris Ellison, OPM Group managing director, said: ‘Tactical use of UV LED on certain print units has doubled this machine’s productivity and our capability to manufacture special new products. Only GEW was able to offer us this package of efficiency, capability and reliability. OPM is a specialist UK converter based in Leeds, West Yorkshire. The company’s product range includes self-adhesive labels and flexible packaging.